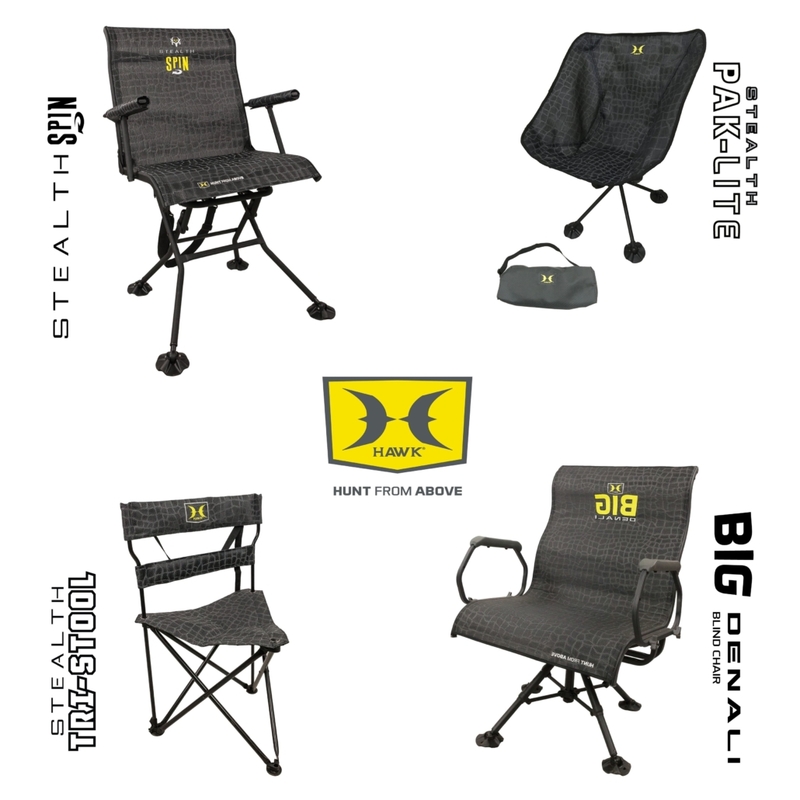 The Hawk® Stealth Series of Hunting Chairs has a seat for you! All chairs are made with the extremely strong and silent MeshComfort™ fabric that is used on Hawk® Tree Stands with durable, proven extended outdoor use. ULTRA LIGHT NEVER CARRY A HEAVY HUNTING CHAIR AGAIN! Heavy-Duty quality made, yet light weight carry that can be used for any outdoor event. Ultra-Compact design weights less than 2.5-LBS and folds up into carrying bag that is size of a large loaf of bread! Take the STEALTH PAK-LITE anywhere; keep one in your pack or hunting tote so you’ll never be without seating! Bone Collector® trusted, the Stealth Spin® lets you be stealthily in perfect position when it’s time to take a shot. Spinning a full 360-degrees, you can effortlessly turn to shoot out any side of your blind. Contoured MeshComfort™ backrest provides all-day support and cool breathability. Quickly folds down for easy transport with included sling. Extra-wide & Extra-comfortable – This is the chair for those looking for some extra space. An XXL MeshComfort™ Lounger chair with a contoured, high backrest provides un-matched comfort and is even paired with molded foam armrests. Swivel silently 360-degrees for any angle shooting. Adjust each leg independently to level out on uneven terrain and adjust overall height from 18” to 20.5”. Swiveling, large “duck” feet on each leg provide added stability and keep the chair from sinking into soft ground. Steel tubing & powder coat finish provides long lasting use. Hawk® also offers several other models of seats, both for ground blind hunting and for attaching to the tree. Visit www.hawkhunting.com to see more.